Fifteen years ago, All Source opened with manufacturing and a distribution center (DC) originating in Barrie, Ontario Canada and a small facility in California. It quickly became clear that the demand for secure information destruction was growing. To keep up with the changes of the growing industry, All Source established itself as the leader where innovative, customer based solutions were always at the forefront and increased not only it’s product line, but also it’s distribution network and service. All Source understands that consumers need their product within very tight timelines. By developing a strategically located, large North American footprint and working with the major North American manufacturers to keep products local, ensuring high quality, durable products it has reduced the time it takes to receive products from the manufacturer and get them the way you need them to your door. This growth began by establishing the Charlotte, North Carolina distribution center. It was opened May of 2008 to increase service to the south and south eastern United States. This facility assembles and carries ready to ship containers in stock for customers so that they can be picked up right at our door or shipped to your location as needed. To further assist and support the Document Destruction industry and more specifically customers located in the central USA and west coast, All Source opened the Irving, Texas DC just outside of Dallas in May 2011. This facility has the ability to assemble and prepare your order to the customer specs and makes them available for pickup or ships containers daily so customers have them when they need them, where they need them! The Phoenix DC location opened in 2013 which is a facility shared with a strategic manufacturing partner of ours originally designed to offer quick turnaround on consoles for the West coast and California specifically to further reduce lead-times in assembly and distribution time for improved service. It has since grown to a full service facility offering access to the full portfolio of Defender carts, bins, totes, desk sides as well as our DF consoles. By 2012 the Barrie Corporate office and DC had outgrown the current needs of AllSource and our customers so we moved across town to a new facility. This provided room to expand our services, growth of our sales and operations team, our innovation center, update our assembly process and provide the space required for additional container storage to ensure superior customer service for the industry’s growing needs. With a strong distribution network and a team ready to manage the future customer service requirements, All Source recognized what is important in the business and adopted the philosophy of “Let our warehouse, be your warehouse!” knowing that many small businesses do not have the space required to stock container inventory until there is demand for it. You worry about shredding and we will worry about making the containers available for you business. By keeping products in stock in our distribution centers, they are ready to ship out as soon as orders are approved. All Source’s quick turnaround times allows customers to order products when they need them and receive them where they need them only a few days later. 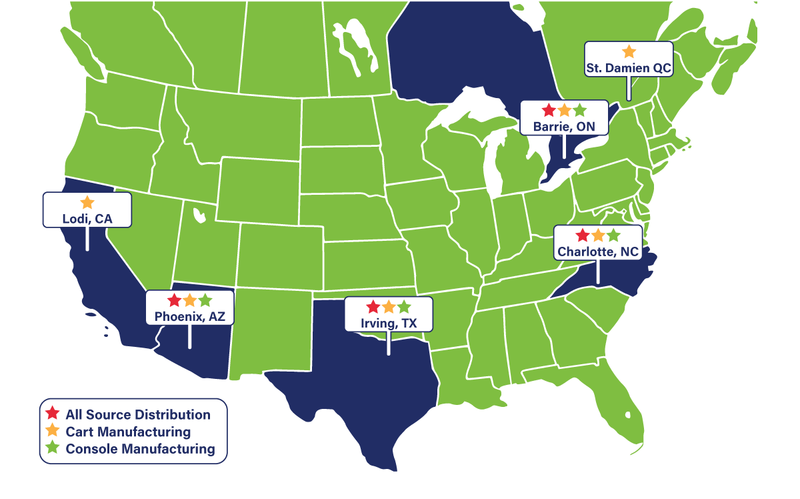 With 4 distribution centers strategically located across North America, there is always one ready to ship to you!